Chris possesses a rich, warm baritone voice and he delivers a song with both power and sensitivity. In a concert or club setting, technical expertise isn't always enough to hold an audience and create a rich entertainment experience. That's where Chris's natural talent as a performer comes in. For many years, he's delighted audiences with his casual banter, his quick wit and his graciousness on stage. ​Although Chris has been focused on studio recording, CD releases and songwriting over the last several years, he has worked on his performance chops since childhood — singing spontaneous, original lyrics as a child, then jamming in college pick-up bands and later holding an audience spellbound in full concerts with top-caliber accompaniment. ​When he takes the stage, the smile on his face reveals just how much he loves his craft. He may be available to provide entertainment for your club, venue or special event. A small, intimate setting may require just Chris and a single accompanist. Or you may have in mind a bigger event, in which case, Chris can be joined onstage by a talented and lively combo. His strong suit is performing cabaret-style sets for a solid, listening audience. Please check out the links below to see Chris's electronic press kit, a photo gallery, and selected videos. "Simply put, Hassett is a masterful crooner who is gifted with a rich baritone voice. If you have a chance, do catch one of his performances.You will not be disappointed. 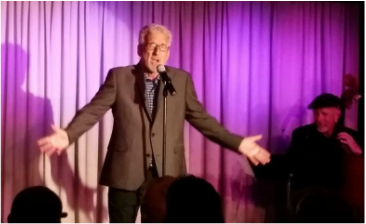 ﻿This video includes clips from a recent cabaret performance, demonstrating Chris's versatility. ​entertainer — gracious, quick-witted, and memorable. ©Chris Hassett. All rights reserved. Login.